I was first properly introduced to Brazilian Graffiti through Ignacio and Louise at Lost Art. In 1999 they sent me copies of Fiz magazine – a magazine designed by Os Gemeos – the magazine completely blew me away! 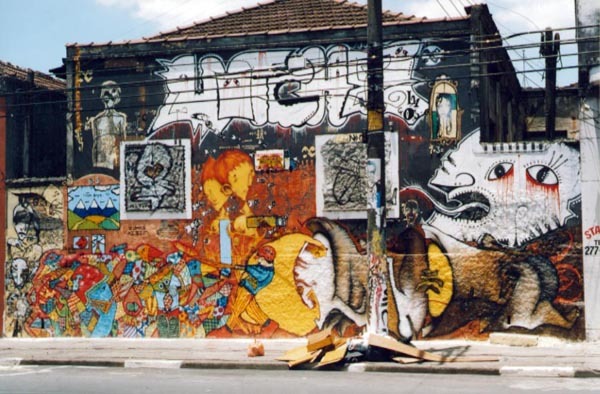 At the time very few gringos were aware of the exciting graffiti scene that was developing especially in Sao Paulo. Twist had spent some time in Sao Paulo in 1993, meeting Os Gemeos which became a two way exchange of ideas. But it wasn’t until Sonik and Raven from 12oz Prophet visited Sao Paulo in 1997, who subsequently did a big feature on the scene, that graffiti writers worldwide become more aware of Brazilian Graffiti. Image above: Sonik, Os Gemeos and Vitche from Caleb’s website. 12ozProphet Presents… Found Footage: 1997 Brazil Graffiti with Os Gemeos, Raven & Sonik from 12ozprophet on Vimeo.